by Lyman C. Draper, edited by Ted Franklin Belue. Hardbound, 576 pages, 6" x 9". 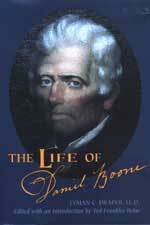 Draper, first secretary of the State Historical Society of Wisconsin, collected more than 500 volumes of material on the famed frontiersman Daniel Boone and the trans-Allegheny West over his lifetime. He set out to write the definitive biography of Boone in the early 1850's, but after 40 years� work, was unable to finish the massive task. Authoritatively edited and annotated, this long-awaited biography is filled with little-known information on Boone and his family, long hunters, the Shawnee, the fur trade, and frontier life in general.